The "Two Tune T.V." is just one of the many classic products from Fisher Price. A great way to save on cable or satellite television fees. Just crank the knob and watch the screen. No batteries or power source required - extremely limited programing. The "Music Box Teaching Clock". Throw away the sundial and hour glass. 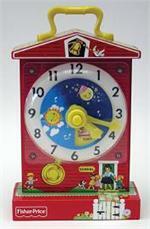 Now your child can learn to tell time with this classic product from Fisher Price. Crank the knob on the back and enjoy the pictures and music for visual and auditory amusement. Please refer to the actual package for age recommendations by the manufacturer. Ultimate Keychains is an online retailer that specializes in novelty keychains. We carry a wide selection of various keychains to suit virtually anyone's taste. Third-party licenses, trademarks and copyrights are that of their respective owners. No claims are made otherwise. Site Logo, Design, Images & All Other Content © 2001-07 UltimateKeychains.com All Rights Reserved.